Pump, Pump and Away is a 2-vs-2 minigame found in Mario Party 3. Its name is a play off the phrase "Up, Up and Away". 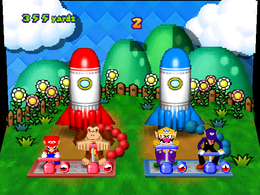 A later minigame, Launch Break in Mario Party 9, exhibits a similar play style. The players in each team will have to pump the air into the rocket much as possible within the ten second time limit. As mentioned in the advice, the player can pump the most air into the rocket when the pump is flashing. 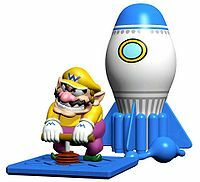 The rocket that flies the highest will win the minigame. If both teams did nothing, they will appear tired and the minigame will end in a draw. It is possible that both teams will have the same distance; one of the teams will win by 48 if this were to occur. Rules: "Press and with good timing to pump your rocket. The team whose rocket flies higher, wins." Advice: "Push the pump down when it flashes to send the most air to the rocket." This page was last edited on March 19, 2018, at 20:54.